I know not everyone like to go all out decorating or making crafts for the holidays but today I’m going to give you a project that hopefully changes you mind. If you are like me you want projects that are EASY and CHEAP. Nobody wants to spend 3 hours of their lives hot gluing wood chips or tissue paper to the outside of a pumpkin.. I get that. So today I’m giving you a project that will take NO time and cost almost NO money! (Hey! I aim to please!!) 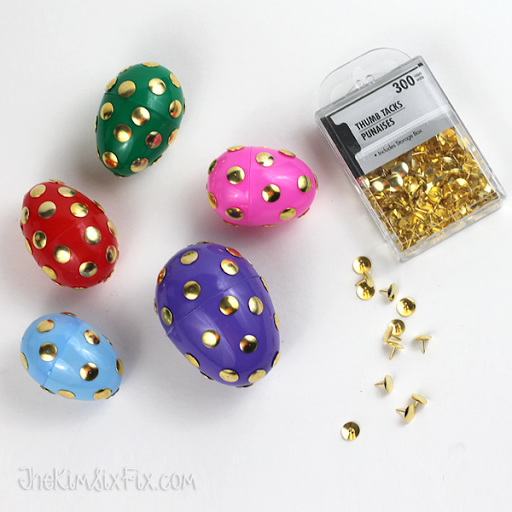 These gold polka dot ‘blinged-out’ easter eggs using thumbtacks are the answer to your prayers. They are faster and easier than the cross stitched ones, and easier on the finger tips than these clothesline or twine versions (since no hot glue is involved). I get mine at the dollar store. (300 for $1!) They had both silver and gold and I went for gold. Step 2: Stick pushpin into egg. I used the deep rich colored eggs since I think that showed off the pins the best and gave the best contrast. There are actually a few tips I learned when I was doing these eggs. 1. You need the softer plastic eggs (the kind that ’squish” a little when you squeeze them. If you use the hard plastic eggs they will crack when you try to put the pins in. 2. The plastic is thicker at the points of the eggs (top and bottom) and at the seam in the middle where they snap closed. Keep this in mind when figuring out where you want to stick your polka dots since your fingers take a lot more wear and tear where the plastic is thicker. 3. It is easier to stick the pins in when the egg is snapped together. Don’t try to take them apart and do each half separately. 4. THESE ARE NOT CHILD FRIENDLY. Don’t leave them out where kids can get them. The pins don’t fall out of the egg easily, but they could be pulled out by small fingers. I used super glue to keep them shut (since the point of the pins are all sticking into the center of the eggs) and I suppose you could super glue each pin on so it didn’t pull out at all, but I still would keep these out of reach of children. Now there are NO excuses for you to not have some ‘custom’ eggs this year. It doesn’t get cheaper or easier than this!